Speed has been part of Zencoder's DNA ever since the first line of code was written. 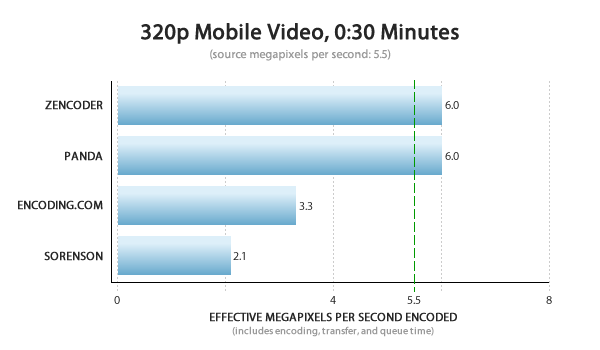 Having been in the video transcoding industry for a few years, we knew that speed was important to most customers. UGC sites don't want to make users wait for video. Professional publishers want to make sure that they can get content online as quickly as possible. And broadcasters want to publish breaking news immediately - one of the reasons that PBS moved to Zencoder. So that's why Zencoder is architected for speed. We've known for a long time that Zencoder is fast - we've optimized every corner of our system for speed, and anecdotally, customers tell us that we beat their previous on-premise systems, or competitive cloud services, by a wide margin. But we haven't really known how fast. So we decided to find a reputable third party to do a performance benchmark of cloud-based transcoding providers. CloudHarmony came quickly to mind. We'd seen their previous work benchmarking cloud computing servers and CDNs, and they seemed like a good fit. We reached out to them, and (full disclosure) Zencoder sponsored a project to benchmark leading cloud-based encoders. We wanted the test to be as fair and transparent as possible. You've seen enough benchmarks to be suspicious of biased or partial tests, right? (If AT&T is really the best 3G network in the country, why do my calls keep dropping?) So CloudHarmony picked four representative files to test: an HD file, a long-form SD file, a short-form SD file, and an audio file. They encoded these files to the exact same settings on each service, encoded them simultaneously on each service, and cycled the tests throughout a 24-hour day across seven days to eliminate time-of-day or day-of-week differences. The methodology is entirely transparent. If there are any flaws in the methodology, we'd be happy to have them re-run the tests. The results: Zencoder is 2x-5x faster than competing services on average. 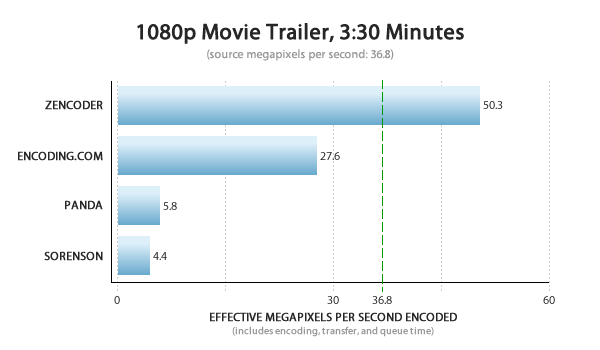 With HD content and long-form content, we're up to 10x faster. 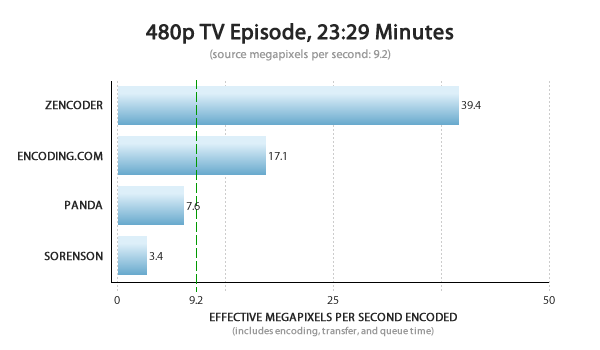 We're the only provider in the test that encoded HD content faster than realtime. And the advantages were consistent - on nearly every test, we come out on top. The full results are available at CloudHarmony. This test doesn't take scalability into account. Scalability and burstability are one of the biggest advantages of the cloud - cloud-based infrastructure like EC2 or Zencoder lets you transparently burst from a small number of resources to a large number of resources. The problem is that not every provider handles this in the same way. With Sorenson and Panda, you have to manually provision new servers when you need them, which means that bursting is your responsibility. Zencoder and Encoding.com take care of this for you. We're big believers in our model - customers should be able to send us one video one day, and 10,000 videos another day, and have the 10,000 videos automatically processed just as quickly as the single video. But because of the different models used by different cloud encoding vendors, it's difficult to determine an apples-to-apples comparison across each model. So that scalability benchmark will need to wait for another day. Similarly, we tried to make transfer time a non-factor by using Amazon S3 as file storage. Every transcoding provider in the test uses Amazon EC2 for transcoding, and we stored files in the same region (US-East) in order to eliminate variability based on transfer time. Transfer times to the cloud are important, but that too will need to wait until another test. Zencoder is architected for speed, and the results prove this. But to be honest, we aren't perfect. We do some things right: well-tuned encoding software, intelligent queuing algorithms, fast hardware, accelerated file transfer. But we also know where we can improve. There are optimizations we can make, small and large, that will further improve our speed, and they're all on our roadmap. We're working on things like Aspera integration, eliminating bottlenecks on the transcoding process, faster servers, smarter job distribution, and lower queue times. Plus the ever present work of finding and eliminating unnecessary overhead in our system. This means that the next time we publish speed benchmarks, we're less interested in comparing our speed against our competitors, and more interested in comparing speed against Zencoder (in previous versions). So if we haven't announced further speed increases by (say) Q1 of next year, get in touch and lodge a formal complaint. The Y Combinator motto is "Make something people want." 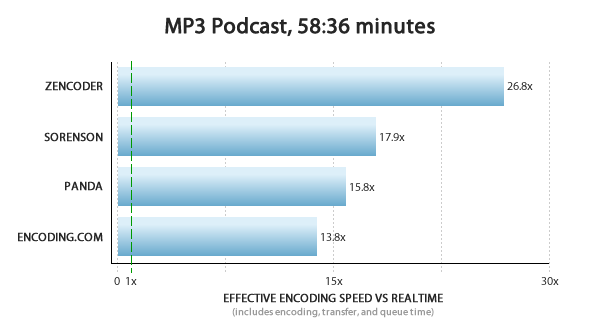 Through conversations with hundreds of video publishers, we discovered that people want fast transcoding times. But that isn't all they want. Video publishers also want things like reliability, high scalability, awesome video and audio quality, and easy integration. So raw speed is only one aspect of performance, and at Zencoder, we're committed to the highest performance in every area. We'd love to be able to objectively quantify our performance in these other areas as well, so look for more benchmarks over the coming months. If you like what we do and believe in our mission of bringing the best possible video performance to the cloud, vote for Zencoder in the Streaming Media Reader’s Choice awards! Voting closes Friday, and it just takes a few seconds. (You don’t have to vote for every category.) We’d really appreciate your vote.